A few months ago, I collected my most frequented pizza spots in one helpful post. Yes, pizza is one of my favorite foods, but a girl can’t live off just one type of simple carb. (That would be unhealthy, obviously.) What of dessert? If you, like me, prefer gluten-based sweets, read on. New York City is swimming, nay, drowning, in exemplary bakeries these days. And these are the treats I choose when I need an afternoon pick-me-up or a post-meal pastry. Best of all, most are under $5. 1. Pretzel croissant at The City Bakery: This original hybrid pastry–introduced nearly 20 years ago–has stood the test of time. Supremely flaky and quite salty, with a pliant, buttery interior, it seems tailor-made for pairing with the bakery’s decadent hot chocolate. 2. Poppy seed danish at Breads Bakery: Nearly everything at this Jewish-inflected bakery is terrific, but when I crave pastry, few things satisfy more than this airy danish stuffed with poppy seeds. As a Russian and lover of all things poppy, I know to look for the one with the most seeds. 3. 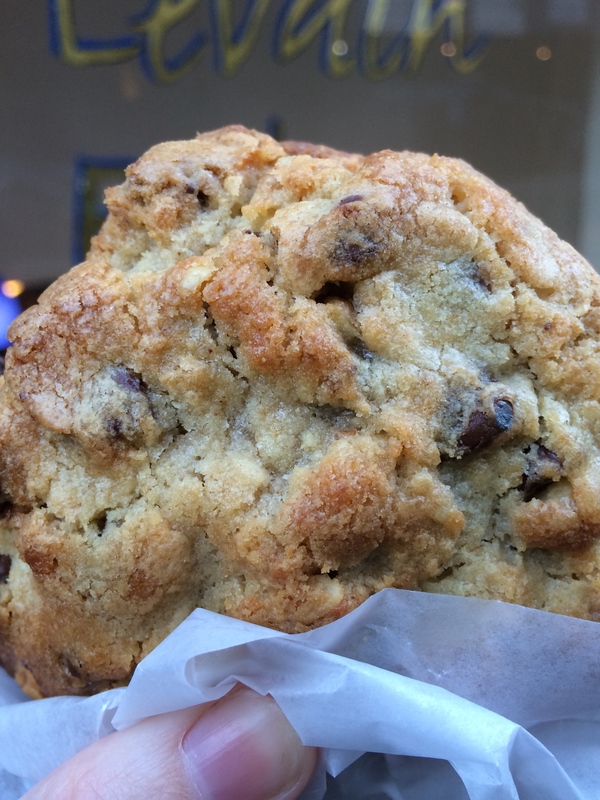 Chocolate chip cookie at Smile To Go: Large discs of Guittard dark chocolate and a hefty sprinkling of sea salt make this chewy CCC one of the best in the city. 4. Plié au chocolate at Maison Kayser: This monstrous pastry solves the there’s-not-nearly-enough-chocolate-in-this-pain-au-chocolat problem. Featuring pastry dough folded over a very generous sprinkling of chocolate chips and a slather of pastry cream, this concoction will satisfy the neediest sweet tooth. 5. Any chocolate pie at Four & Twenty Blackbirds: Whether it’s the chocolate julep pie pictured below (chocolate, mint and bourbon), the chocolate chess pie (chocolate custard) or the black-bottom oat pie (chocolate ganache and oats), the chocolate-focused offerings at this demure pie shop on an industrial stretch in Gowanus live up to the media-generated hype. The fillings are luscious, but it’s the buttery, crackly crust that really makes these slices stand out. 6. 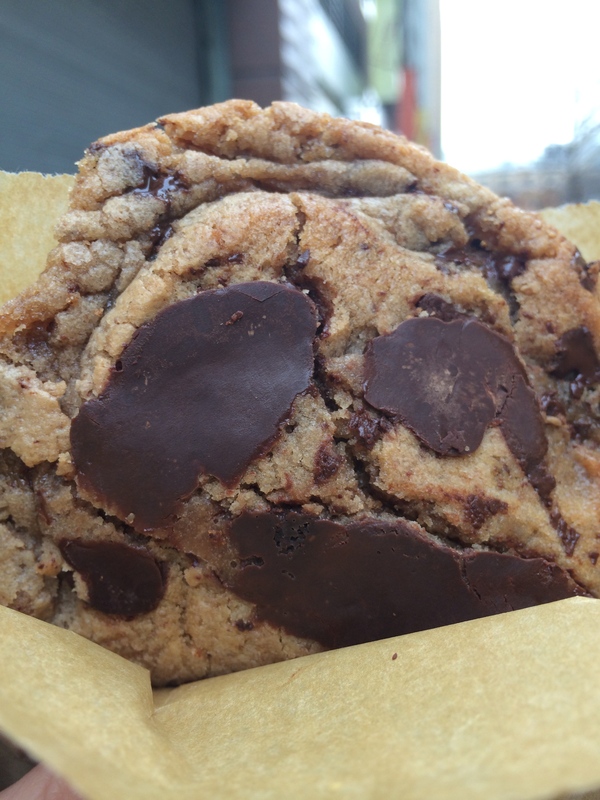 Nutella cookie at Buttermilk Bakeshop: Close your eyes. Are they closed? Okay, good. Now imagine the perfect cookie: an underbaked, super-moist, brownie-like chocolate creation with a large dollop of Nutella and a sprinkling of flaky sea salt. No, this isn’t a drug-fueled fantasy. It’s real life. 7. Chocolate chip pudding at Sugar Sweet Sunshine Bakery: I wrote about this pudding years ago, and I still haven’t wavered in my love. The softened chocolate chip cookie chunks evoke cookies dunked in milk, childhood, home, family and the existential beauty that defines life itself. In summary: it’s really good. 8. Brooklyn Blackout doughnut at Doughnut Plant: How do I love thee, Doughnut Plant? Let me count that ways. We can start with this sensational chocolate cake doughnut, which is arguably the moistest cake doughnut I’ve ever had. A thin filling of chocolate pudding and a topping of cake crumbs make this dessert suitable for chocolate-craving emergencies. 9. Signature bars at Mah Ze Dahr Bakery: The namesake treat from this mostly-online bakery (choice items are also sold at Intelligentsia Coffee inside the High Line Hotel; a brick-and-mortar West Village outpost is slated to open any minute) is all about the ingredients. They’re simple–butter, oats, cream, pecans, fleur de sel, semisweet chocolate, brown sugar, flour, vanilla extract–so it’s a testament to their quality and the expert way in which they’re combined when the result is so delicious. 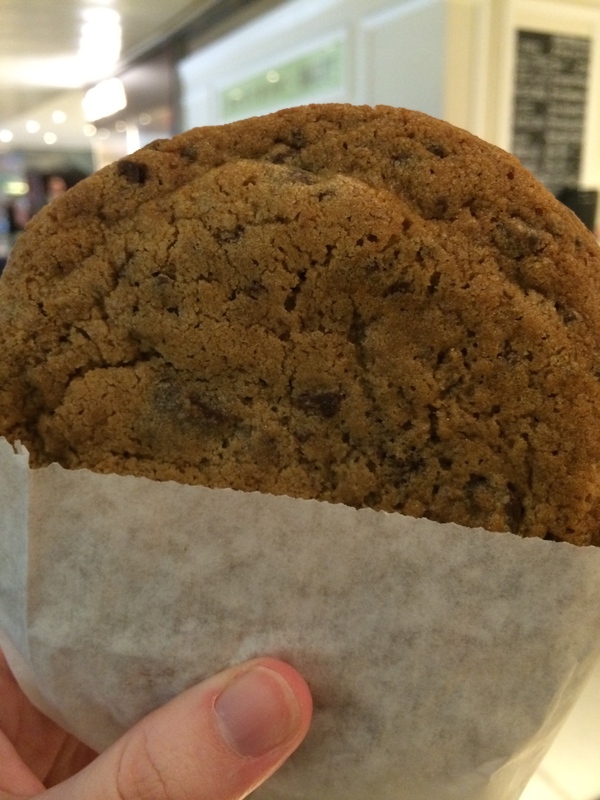 There’s something about a chocolate chip cookie (CCC, for short) that embodies a certain casual American exceptionalism. The French, Kings of Pastry as they deservedly are, take hours to make and assemble the perfect croissant or ideal Paris-Brest or any number of other complex dough-and-cream concoctions. We Americans get to waltz in with our flour and our sugar and our eggs and our chocolate chips and–in 10 minutes flat–create something near Godliness. Hold off on those U-S-A!, U-S-A! cheers, though. In NYC it’s French bakeries, with their supreme attention to detail, that are churning out some of the best versions of the CCC in the city. 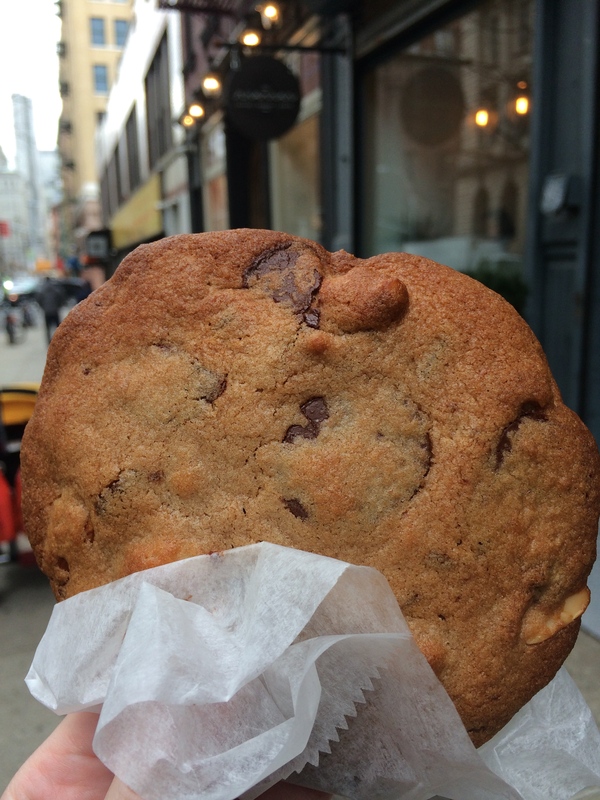 For this roundup, I sampled 18 cookies all across NYC. There were plenty of winners, and I found it difficult to whittle down my favorites to a “Top 5” so I went with a “Top 6.” All are exceptional in their own way. 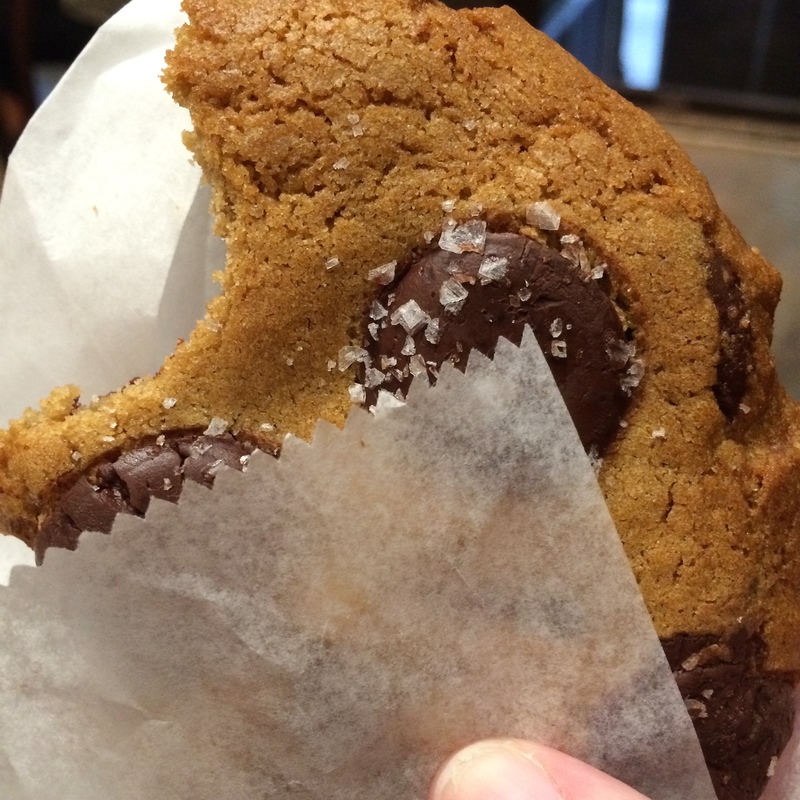 Smile To Go: This cookie has an intense brown sugar flavor that plays off of the saltiness of large visible flakes (seen below), creating an ideal medley of salty-sweet. The chocolate disks are ideally distributed throughout. Maman: If I were to award an official No. 1, this gargantuan cookie would be it. From the cutesy new French bakery in Soho, this CCC is perfectly browned on the edges with an incredibly melty, gooey middle. Also, I’m usually a hater of nuts-in-cookies, but the whole hazelnuts here add great texture. The Dessert Club by Chikalicious: This has been one of my favorite CCCs for years (at the sister location in the East Village), and the one at the new spot is just as lovely. It’s slightly underdone with crunchy edges and a chewy interior. They know to warm up the cookie to order for just the right amount of time to achieve optimal softness. Levain Bakery: The most famous of the bunch, this French bakery is perpetually mobbed–and with good reason. They churn out large mounds of deliciously under-baked CCCs that are so heavy, you could use them for weight training. Bring a friend and indulge in the cookie dough-like interior. There are walnuts, but they’re not super loud about making their presence known, if you know what I mean. Pret a Manger: Yes, it’s a chain, but so what? These cookies can compete with some of the top bakeries on this list. They’re kept under a warming lamp, so they’re toasty and gooey no matter what time of day you purchase one. There’s a crunchiness at the edges that gives them a nice textural balance. 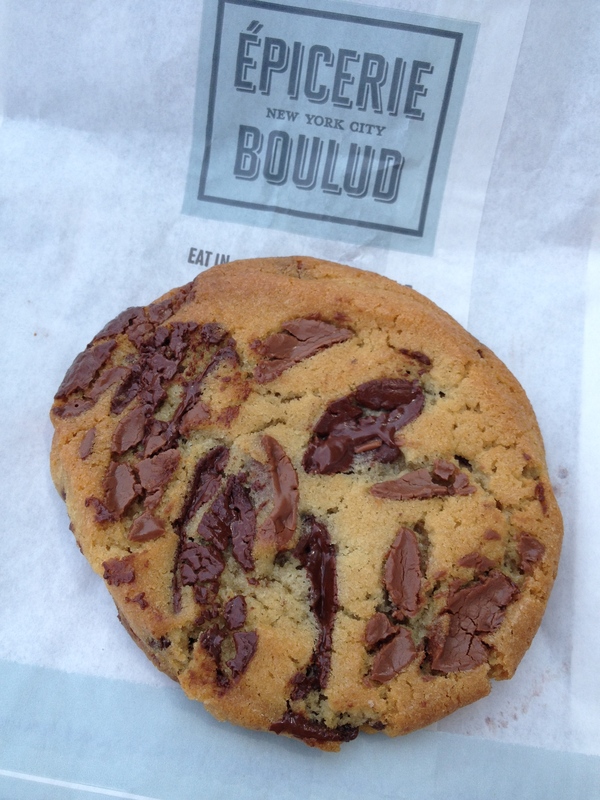 Épicerie Boulud: Another Frenchy on our list, this cookie has it all. It’s buttery and soft, with a proportional combination of dark chocolate and milk chocolate discs. I’ve only ever had it warm, so in order to experience the magic, it would be worth it to ask if the ones on display are fresh out of the kitchen. Blue Ribbon Bakery Market: The smallest (and cheapest, at $1) of the bunch, this cookie has a lovely home-baked quality. It’s soft, crumbly and not overly buttery. A perfect CCC for when you want a cookie all to yourself, but don’t want to consume a 500-calorie sugar bomb. 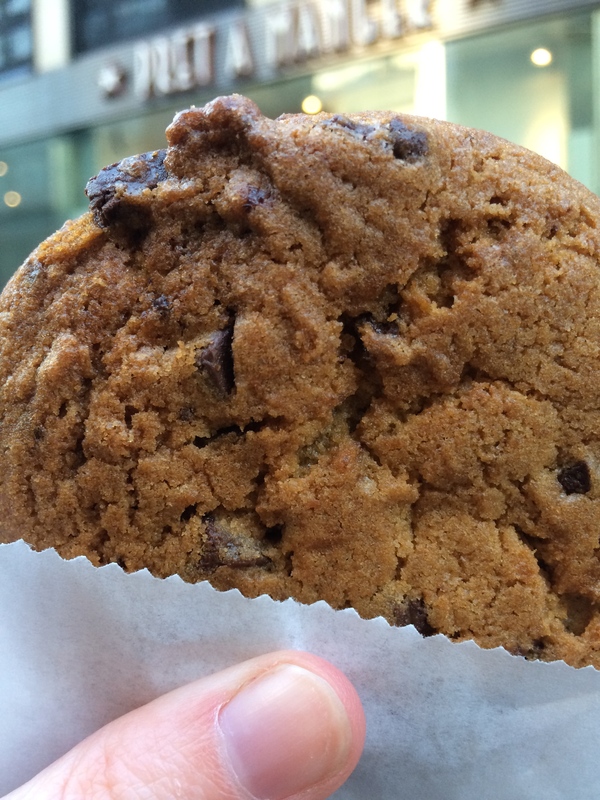 Macchiato: A great spot for cookie cravings in Midtown, this European coffee shop stocks perpetually warm cookies with intense chocolate flavor. Bouchon Bakery: Yet another French bakery with a great CCC. 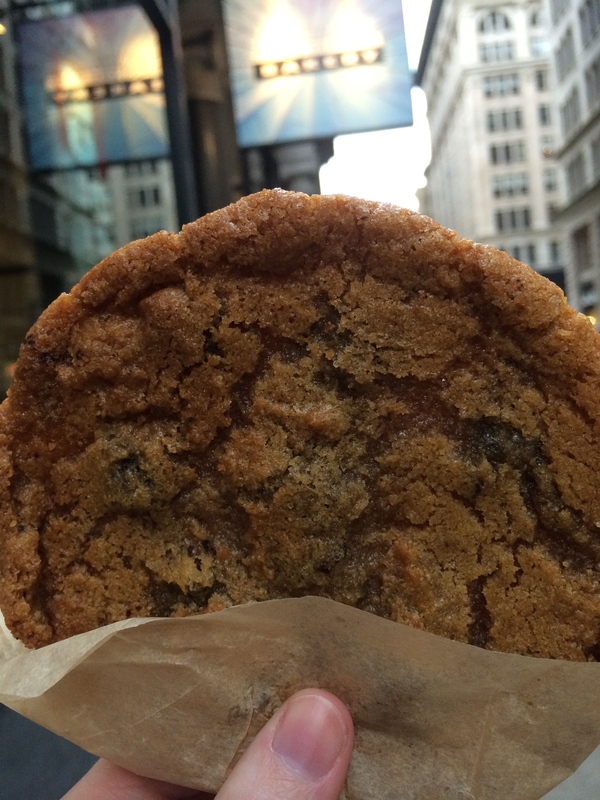 This cookie is huge–nearly literally the size of one’s head. The edges are crunchy, but take one more bite and you’re in pliant, chewy heaven. 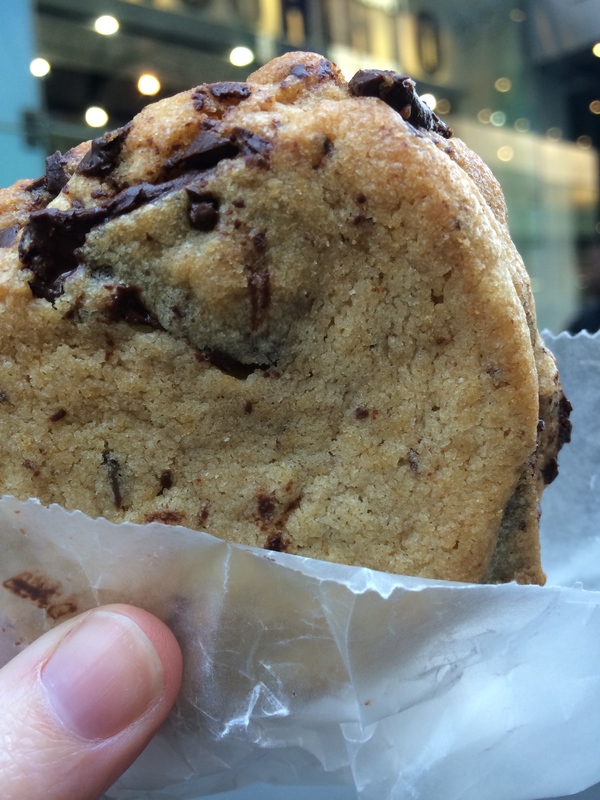 The City Bakery: This institution has expanded its dessert empire with Birdbath Bakeries all around Manhattan, featuring the original icon’s famous cookies. The CCC here is flat, chewy and just right amount of underdone. It goes well with their exceptional hot chocolate, if you’re looking to spend the subsequent hours in a blissful sugar coma. 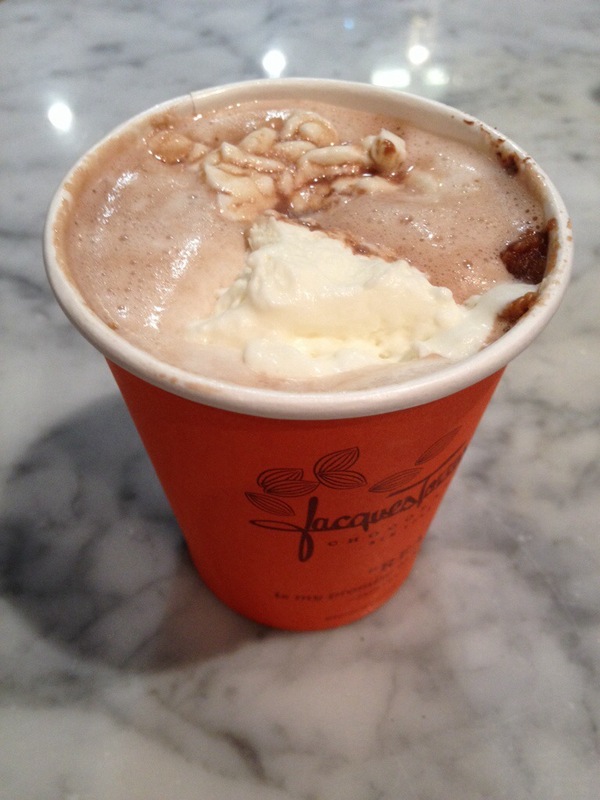 Jacques Torres Chocolate: Jacques knows his customers, and what he knows is they want a warm CCC. They keep some of the cookies on a hot plate all day to ensure the one you receive is warm and soft. Mine may have spent a little too much time on the plate; it was falling apart when I held it up for a photo. Jacques is also the king of chocolate chip layering–a cross section resembles sedimentary rocks, which is perhaps why his chocolate chip cookie recipe is an Internet favorite. 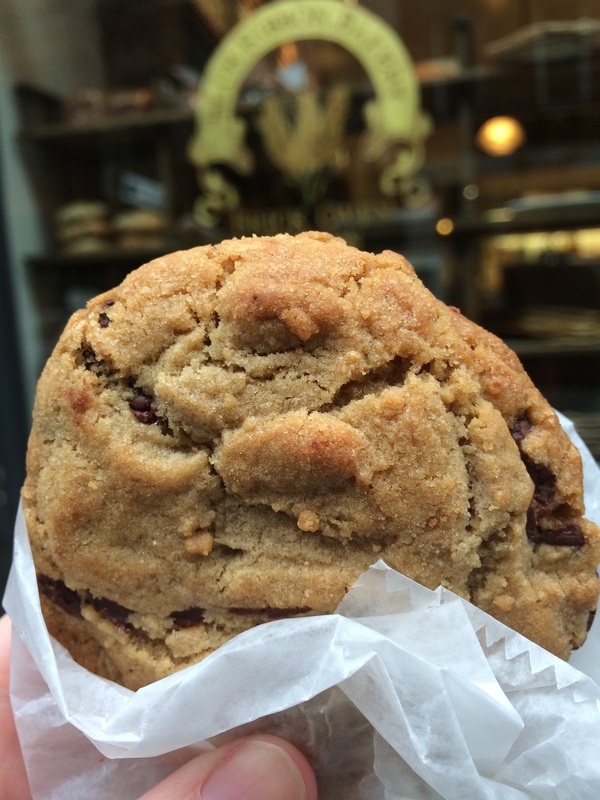 Other cookies sampled: Amy’s Bread, BKLYN Larder, Milk & Cookies Bakery, Breads Bakery, Baked, Maison Kayser, Roasting Plant. 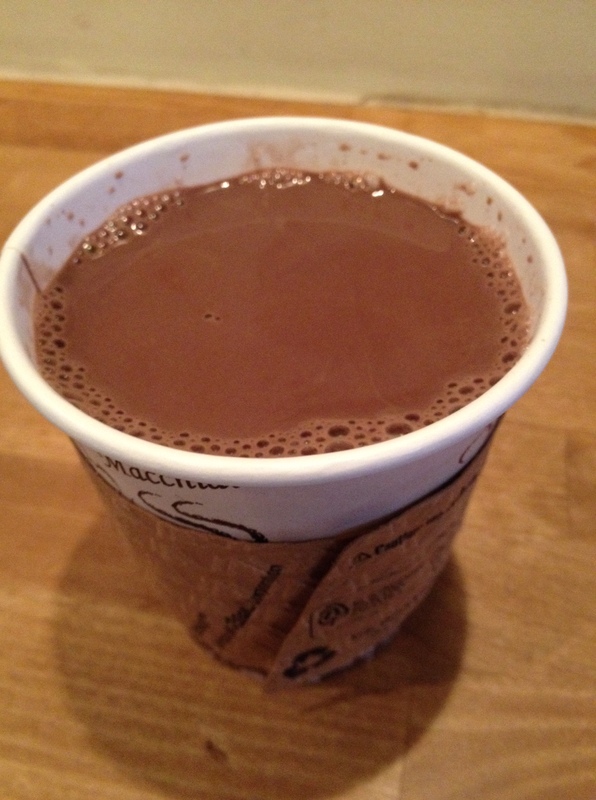 When a polar vortex threatens, my beverage of choice is a cup of glove-warming hot chocolate. Thankfully, this city has a slew of places that specialize in liquified chocolate. Now, for the criteria. You don’t want it to be too watery; it should coat the inside of the cup. The chocolate should leave “tree rings” as you drink. Also, this is a bit vague, but the drink should taste layered–more than the sum of its parts. I drank a lot of hot chocolate for this write-up, so toward the end of my research, the most notable criteria was whether–after so much taste-testing–I wanted to keep drinking. Since all of the below are so different, and it’s hard to pick a favorite, I’ve assigned superlatives. I should also note that though hot chocolate usually means chocolate bits melted by steamed milk while hot cocoa is cocoa powder mixed with milk and often sugar, some places use the terms interchangeably, with hot chocolate being the catch-all. Most Comforting: The Chocolate Room, Park Slope. For $4.75, you get a huge cup of hot chocolate. The added fresh whipped cream was $0.75 extra, but so worth it. The hot chocolate was milky, but not overly so, and intensely satisfying. 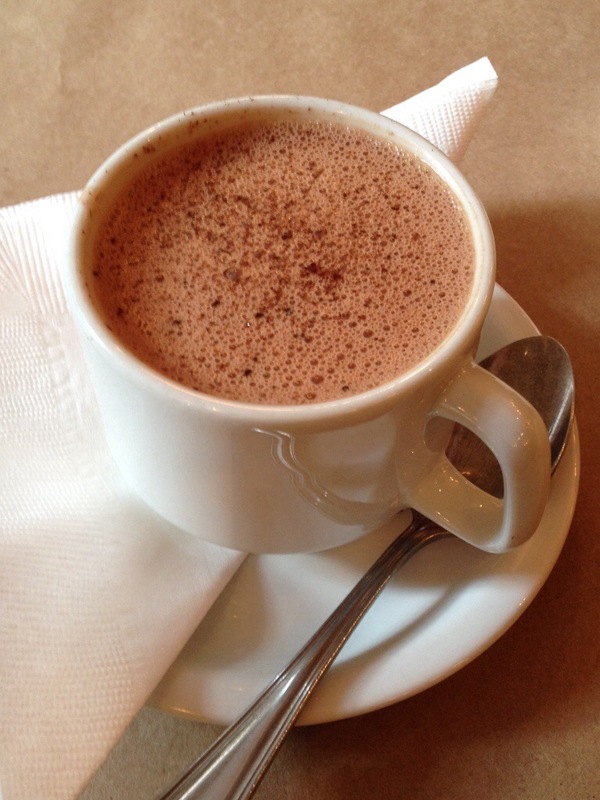 The texture was more traditional and less thick than many of the more European, “drinking chocolate” places in NYC. I enjoyed it to-stay, with a complimentary amuse bouche of tiny dark chocolate-almond financier. Best Deal: Jacques Torres Chocolate, multiple locations. The classic or wicked (spiced) hot chocolate at one of the best chocolate shops in the city is still $3.25 for the small. If you want to try one of their other flavors, it’ll set you back $3.50. I went for the peanut butter. Yep, I said peanut- frickin’-butter. In hot chocolate. Awesome. The beverage itself is thick and molasses-y, in the best possible way. The whipped cream, spooned in from a bowl, is complimentary if you request it. Overall, a delicious and unique cup. The Classic for a Reason: The City Bakery, Flatiron. 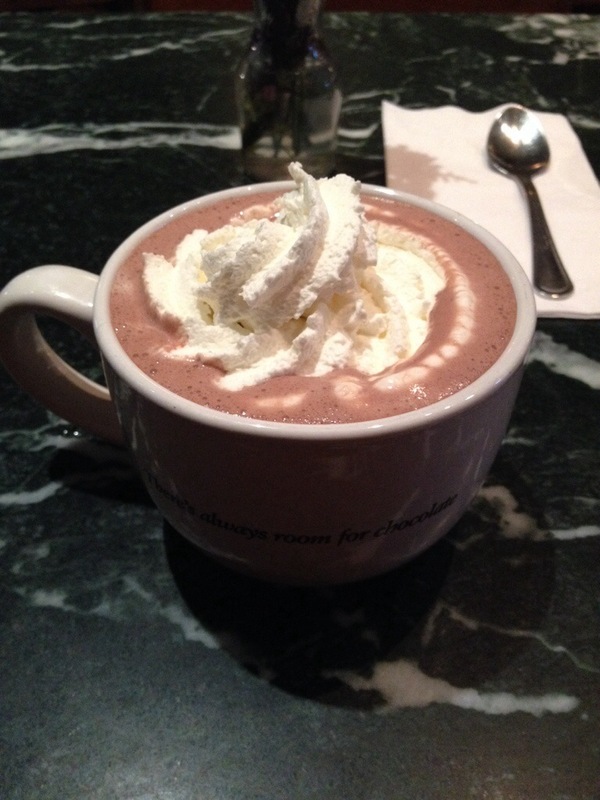 This place has been the hot chocolate go-to for years. They even have a yearly hot chocolate festival. (City Bakery is also home to the awe-inspiring pretzel croissant, NYC’s first hybrid pastry.) 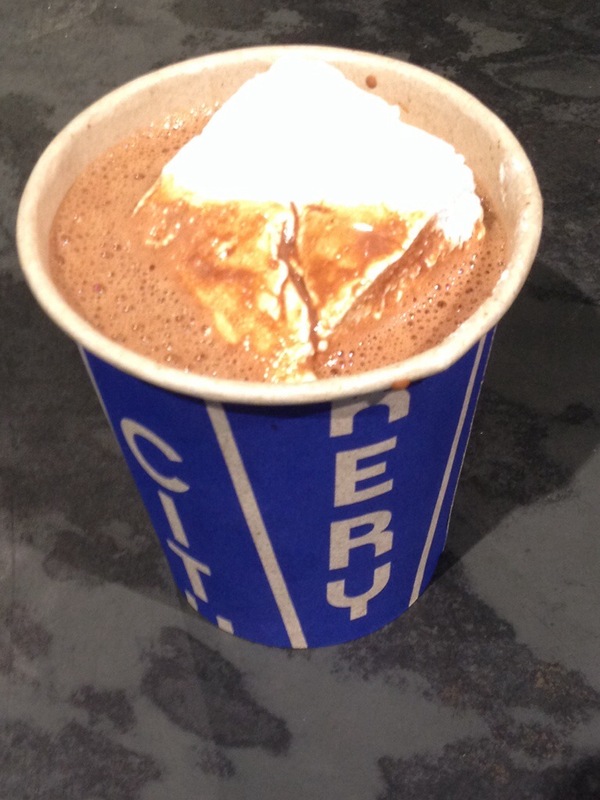 Yes, it’s busy and touristy, but the freshly made hot chocolate is sweet, rich and delicious. 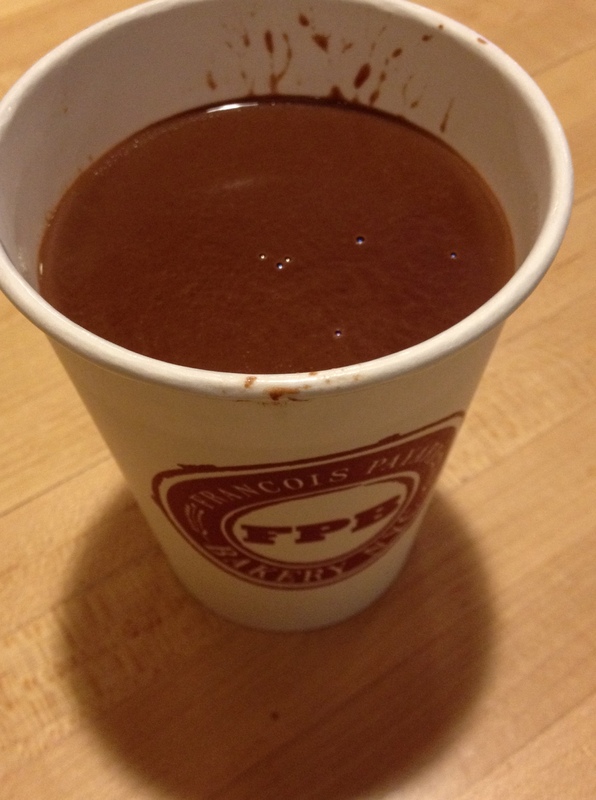 Like the Jacques Torres cup, it’s a thick drinking chocolate. The oversize house-made marshmallow, though not completely necessary considering how satisfying the chocolate is on its own, is pliable without being spongey or tasting chemically. Not the cheapest option at over $7, with the marshmallow, but I would argue definitely worth it. Simplest: L.A. Burdick, Flatiron. 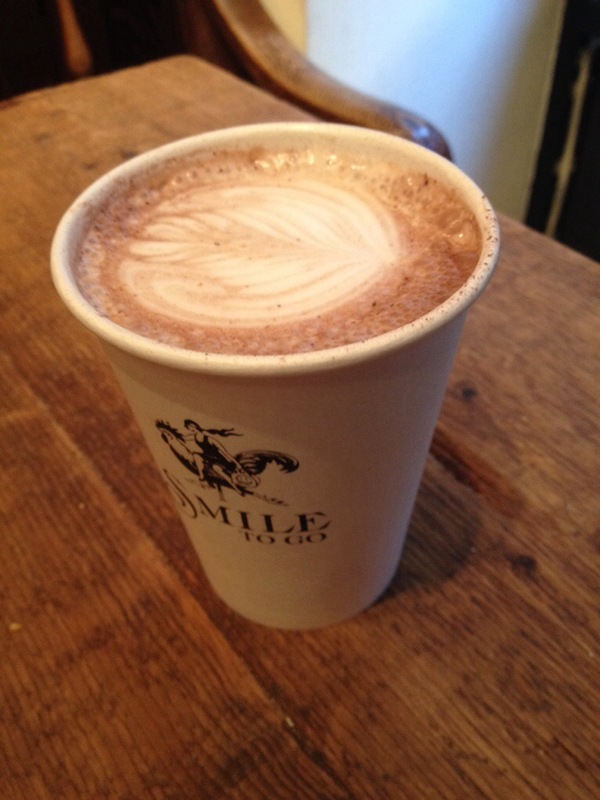 There aren’t many bells and whistles here, just a satisfying, drinkable cup of really quality hot chocolate. At $4.75 for the small mug pictured below, it’s also a cup you can actually finish on your own. Definitely one of my favorites. Plus, the cozy shop, with its handful of tables and delicious cakes by the slice is a great place to take a break on a chilly afternoon. Best Ambiance: MarieBelle, Soho. I was the only non-tourist at this elegant waitress-service hot chocolate salon in the the back of the brand’s retail shop. The espresso-sized adorable teacup below will set you back $5 ($7 if you want a normal-sized teacup), which gives this hot chocolate the distinction of being among the priciest on this list. The chocolate itself was sublime. Rich, very layered and compulsively drinkable. There are countless options and combinations for your chocolate: milk, dark, white, European, American, hot cold, flavored. 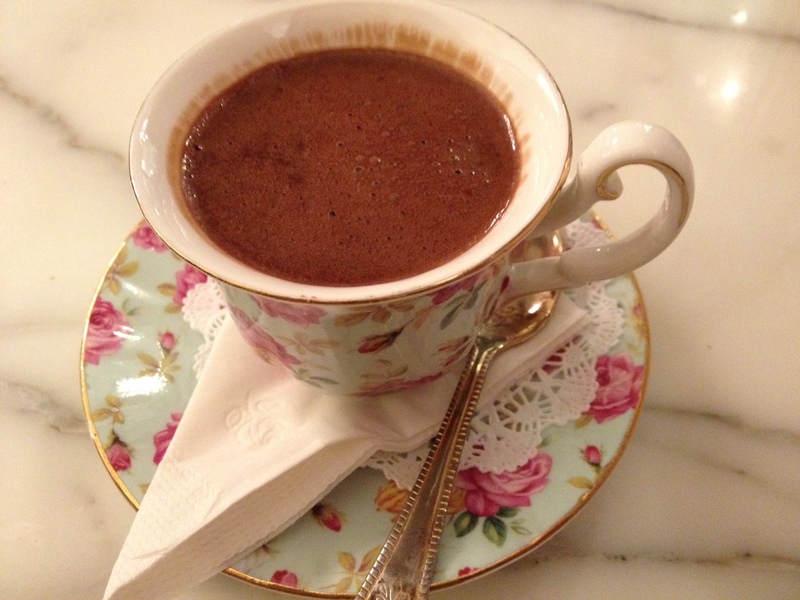 There’s even a list of over a dozen specially-sourced chocolate drinks, including “Jefferson’s Hot Chocolate” from my home state of Virginia. My cup was milk chocolate and hazelnut. Instead of being added via syrup, which would’ve been the easiest option, the hazelnuts are actually ground and incorporated into the chocolate. And yes, it’s expensive, but it was the perfect size for me; I actually finished the whole thing. 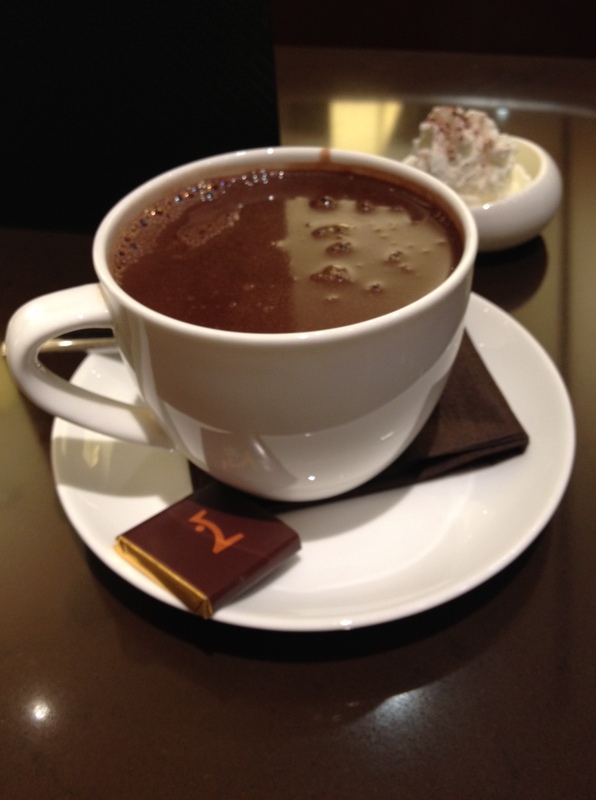 Fanciest: La Maison du Chocolat, multiple locations. When visiting an establishment during my research, I always asked for the drink to-stay, if it was an option, just to see what the presentation was like. French chocolatier La Maison went all out, which a small plate of cocoa-dusted whipped cream, a glass of water and a complimentary piece of chocolate. The cup itself was also the most expensive, at $8.50. After trying so many milk hot chocolates, I went for the dark (the other option was vanilla-infused dark) and it was intense, the thickest of all of the hot chocolates on this list. It almost had the consistency of the melted chocolate one would dip churros into. Best Presentation: Vosges Haut-Chocolate, Soho and the Upper East Side. This Chicago-based chocolatier sells unique and exotic chocolates in beautiful packaging and was one of the first to spearhead the whole bacon-and-chocolate trend. When I asked for my hot chocolate to-stay, I wasn’t sure what to expect, since at the Soho location, the sit-down area is just one long high table. It’s not really waiter service either, just a “sit and we’ll bring it out to you” thing. Which is why I was shocked when the below arrived, all included in the $5 price. The hot chocolate was served on hipster-y driftwood, with powdered sugar-vanilla-bean whipped cream and samples of their brand new peanut butter-salt-milk chocolate bar. It was smooth and drinkable, with a nice vanilla flavor. Other options include a multi-spice dark chocolate or a white chocolate. Most Homemade Tasting: Dessert Club, ChikaLicious, East Village. This dessert shop is known for its creative, hybrid pastries. (People love its unique puddings, flavored ices and ice cream sandwiches.) 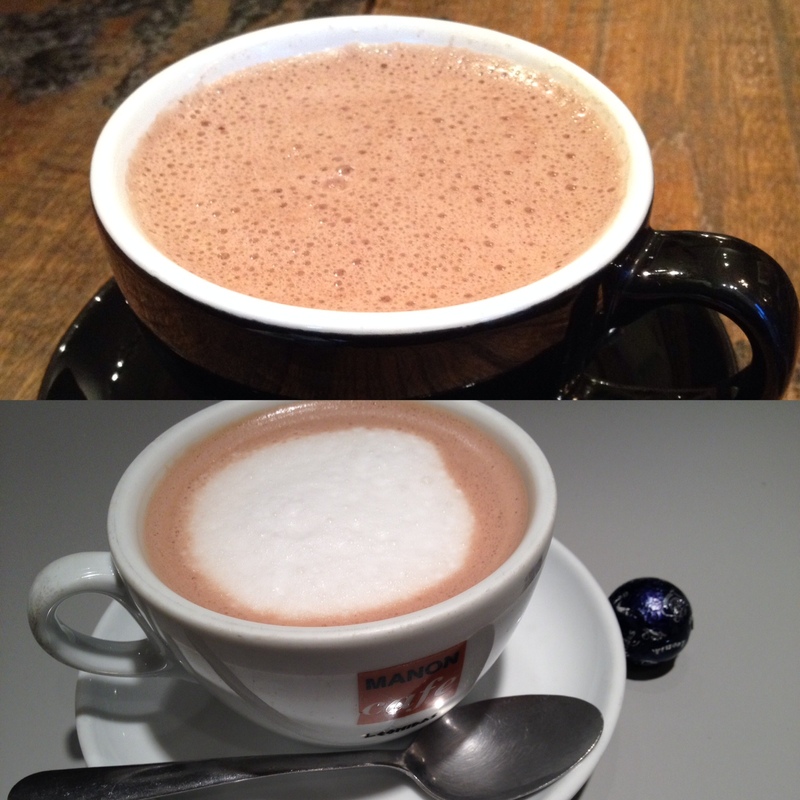 The hot chocolate–hot cocoa? (it’s listed at $5.05, but I was charged $4.75, maybe because of the off hour) is a solid contender. It comes pre-made from a heated vat and tastes almost identical to the kind of hot chocolate one would make at home, i.e. sweet, but not overly so, with just the right consistency. It’s not the fanciest or most complex cup, but it tastes great nonetheless. Biggest Surprise: Smile To Go, Soho. I wasn’t expecting much when I stepped into this gourmet prepared foods shop for a pick-me-up. It wasn’t even a part of my research. The melty chocolate was delicious and the milk was steamy but not overly frothy (which is categorically the worst thing ever). Plus, I finally got to experience a bit of latte art without having to order an actual coffee. Great for the ‘Hood: Nunu Chocolates, Downtown Brooklyn (top) and Leonidas/Manon Cafe (bottom), Financial District. Both of these establishments make very tasty if not extremely memorable cups of hot chocolate. Nunu Chocolates has been making single-origin artisanal chocolate in Brooklyn for years, and their cup ($4 for a small) features their quality chocolate, melted with milk into a satisfying, not overly thick blend. Leonidas makes fine Belgian chocolates and the no-frills cafe in the back of their Financial District shop delivers a sweet milk-chocolate-y cup (the milk is their standard; a dark or caramel is also available) with your choice of white, dark or milk chocolate candy sample. A small will run you $4.75. Also Really Good: Francois Payard Bakery (FPB), multiple locations. Okay, so that’s not a real superlative, but I’m running out of unique attributes here! Though the hot chocolate at this venerated French pastry chef’s bakery outposts is pre-made, it is incredibly thick and indulgent, owing to the heavy cream in the recipe. Split with a friend if you want a shot a finishing the entire cup ($5). The Rest: The Chocolate Bar, West Village (left) and Peels, East Village (right). Though the Chocolate Bar hot chocolate ($4.50 for a small) isn’t at the top of my list, the shop does score points for having a lot of flavor options, including peanut butter (which I had to go for again, obviously), peppermint, caramel, hazelnut and many others. The actual hot chocolate was a tad watery for my taste, but good for someone who doesn’t want an overwhelming cup. 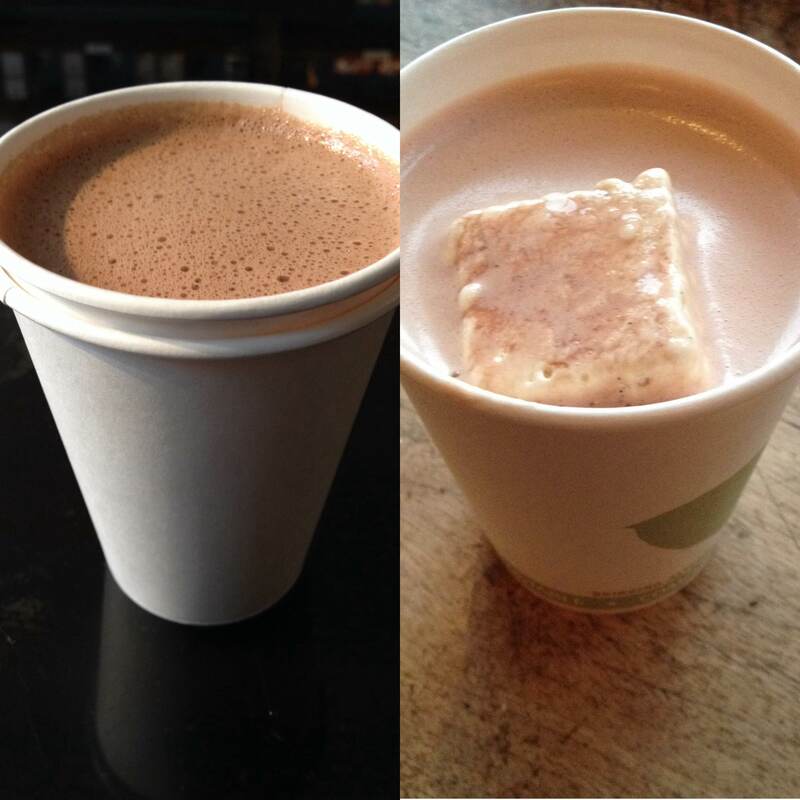 The Peels hot chocolate ($3.50) had way too much milk, which could’ve just been a symptom of inconsistency. 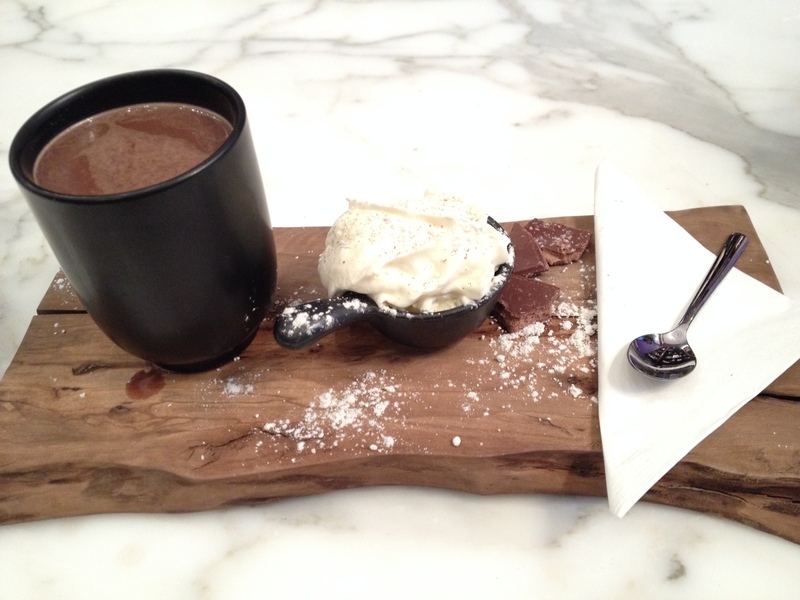 As you can see, it couldn’t be more different from the thick and fudgy hot chocolate the food website Serious Eats received when they visited a few years back. The house-made marshmallow is complimentary.